Teamwork and revenue success are directly related! Every few days I hear someone describe that sales and marketing alignment is necessary for Account Based Marketing. I agree, but isn’t that the same point for effective B2B marketing in general? Nevertheless, I was struck by a nugget of research springing from a new Demandbase / Demand Metric research report: Account-Based Marketing Adoption. Now, we have actual data to quantify this point of view, and success at generating incremental revenue through ABM is directly related to the quality of sales and marketing alignment. 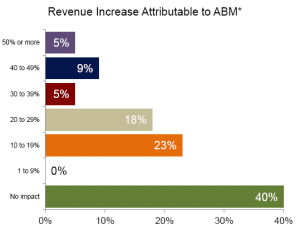 I encourage everyone to download the full report but the nuts and bolts of the data indicate that 40% of ABM programs show no revenue increase after a year of work, but 100% of those programs also indicate that they have less than satisfactory sales and marketing alignment. Wow!